1 Blooming Size Bulb. 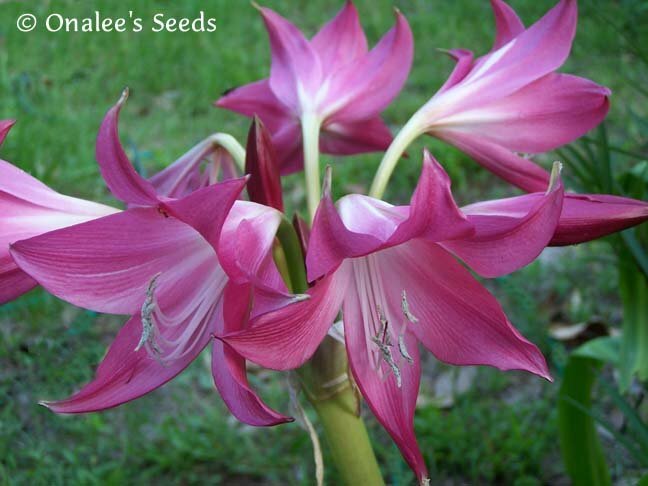 A Florida Hybrid Crinum Lily which I believe to be either ''Ellen Bosanquet'' or ''Elizabeth Traub'', Whatever the name, it is a WONDERFUL, EASY to grow plant that will reward you with dark pink blooms during the warm summer months! You are buying one Florida Hybrid Crinum Lily Plant/Bulb which I believe to be either 'Ellen Bosanquet" or 'Elizabeth Traub" some of the old 'Florida Crackers" around here call these crinums 'Candle Sticks" because of the way the blooms stand so tall above the foilage. Whatever the name, it is a WONDERFUL, EASY to grow plant that will reward you with dark pink blooms during the warm summer months! This is a LARGE BLOOMING SIZE BULB that is larger than a standard baseball and is over 2 years old. As always, planting and care instructions are included with all my items. I will remove the long leaves before shipping these will re-grow once planted in it's new home! 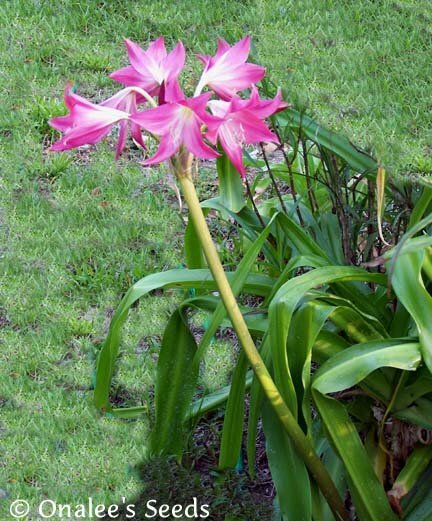 This old fashioned crinum lily is a low maintence plant that produces lovely dark pink to reddish-pink blooms about the size of an Easter Lily. The tall bloom stalk stands about 18 - 24 inches above the abundant foilage and holds several blooms at a time! These lilies are cold hardy to USDA zone 8 (some report zone 7, but they are not consistently hardy in zone 7 from my experience) and grow very well all the way to zone 11 in full sun or partial shade. These will produce several flower stalks during the warmer months with the majority of blooms coming in the spring and fall. These lilies will multiply freely by producing bulbs off the main 'mother" bulb (they don't get seeds). You'll have a lovely large group of these in no time at all! Prefers bright sunny situations but will grow in medium shade - especially in the hottest zones. Grows best in well draining, sandy soil.